This 3 bedroom villa really is exceptional! It is of fantastic quality, immaculate, spacious and being sold fully furnished with superb furniture! Two bedrooms are downstairs with a family bathroom; the open-plan living space is bright and has French windows all around, leading to the shady terrace and lovely stone pillars. The master is upstairs with an ensuite bathroom and there is a huge roof terrace (that is also accessible from the garden), which has a covered pergola, large enough for a table and chairs and summer sofas! You even have a sink and electric up there, perfect for BBQs and entertaining! This award winning complex that this stunning villa sits on has beautifully landscaped gardens, 3 communal swimming pools, including a childrens one, a childrens play area, a gymnasium, a modern restaurant/bar and even steps down to a lovely sandy cove! All in all a gem of a home…with full individual title deeds in the owners name and all taxes paid. Bargain Buy- First deposit secures. Solid wood entrance door leading to hallway, windows and patio doors, marble floor. Triple aspect with windows and patio doors to side, patio doors to rear covered terrace, air conditioning unit, lounge with feature fireplace, kitchen area has a range of eye and base level fitted kitchen units incorporating ceramic tiled splashbacks, stainless steel sink, hob, fitted oven, extractor fan, fridge freezer, washing machine, dishwasher and breakfast bar, marble floor. Window to front, air conditioning unit, range of fitted wardrobes, marble floor. Window to side, ceramic tiled walls, bath with shower screen and shower over, pedestal wash basin, low level WC, marble floor. Marble staircase with wrought iron balustrade, window to side and door to large roof terrace. Dual aspect with windows to front and patio door to large roof terrace, air conditioning unit, range of fitted wardrobes, marble floor. Window to front, ceramic tiled walls, bath with shower over, pedestal wash basin, low level WC, marble floor. The large roof terrace is what holiday dreams are made of, beautiful views with a large pergola covering the seating area. With enough room to entertain a large quantity of guests this is one area that you will enjoy, you can watch the sunset, sunbath or just look in awe at the mountains. The large roof terrace can be accessed via the garden or via the master bedroom and landing. This property has a lovely garden that goes around the property and is a good size, there is a driveway to the side of the house that can accommodate two cars. The large ground floor terrace is covered with sailcloth supported on natural stone columns, the garden is mainly laid with gravel making it very low maintenance. Tatlisu (meaning Sweet Water) is only a short drive from the Korineum Golf Course and is situated close to the peaceful and quaint Cypriot village of Esentepe where you will find grocers shops, bars and restaurants. Living near Tatlisu one gets the best of all worlds; easy access to the resort town of Kyrenia, easy access to both Ercan Airport and the Metehan border crossing for links to south Cyprus, Karpaz Gate Marina and Famagusta. 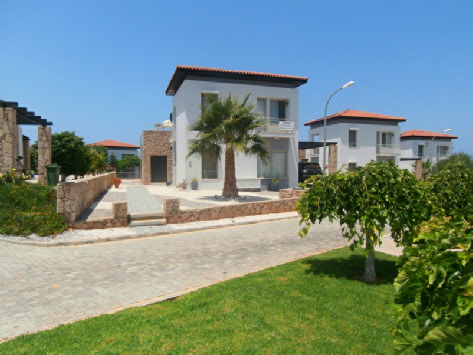 All this from a location that benefits from some of the very best Cyprus views, and the stunning Mediterranean climate.